Competition to be the company that brings smart home technology to Britain and cuts energy bills is hotting up. 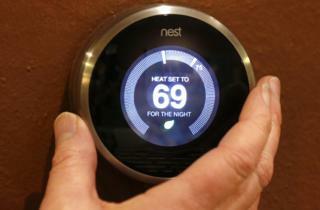 Nest, the firm whose smart thermostat has been a big hit in the United States, is launching in the UK. The device, from a team which cut its design teeth at Apple, connects wirelessly to your boiler and can be controlled remotely via a smartphone app. It learns your daily routine and adjusts the temperature accordingly. But, with the weather warming up and at least one energy firm promising to freeze bills, April might not seem the best month to be promising to disrupt the market with new technology. What's more, this relatively new market is already quite crowded. Hive Active Heating, owned by British Gas, launched last September and is apparently already in 50,000 homes. Honeywell, whose brand is already familiar in many British homes, has its multi-room system on the market. And a firm called Tado, which is the market leader in this technology in Germany, is now making a big push into the UK. But Nest has one key advantage - it is now owned by a firm with more money and power than anyone else in the market. In January Google bought Nest for $3.2bn (£1.9bn) and made bold pronouncements about its ambitions to be a player in the connected home. The UK launch is the first major event at Nest since the Google takeover, so the new owners will be watching carefully to see how consumers react. Two questions hang in the air - is there really much of an appetite for smart heating control systems, and if so, do people want to buy one from a search giant whose business model depends on collecting personal data? It's not cheap to make your home's heating system smart - £249 including installation. (Mind you, if the engineers spend 90 minutes installing the system, as advertised, the margins for Nest must look pretty slim). That compares with £199 for Hive, the rival product from British Gas, which has an existing network of 12,000 engineers to call upon. But like its rivals, Nest is claiming that consumers make big savings once they have made the initial investment in a learning thermostat. The company says its US customers "experience savings of approximately 20% on average off their heating and cooling bill and we're looking forward to helping customers in the UK save as well". Now the UK is a different market - nobody here spends much on cooling - so customers will need some hard evidence of savings before they can work out how long it takes a Nest owner to recoup that initial £249. But beyond the hard sell of promised savings, Nest and its new owner have to convince British consumers that they need a smart device controlling their heating and monitoring their presence at home and that they are happy for it to be owned by Google. To help spread its message in the British market Nest has formed a marketing partnership with Npower, although given the current reputation of the big six energy firms that may be a mixed blessing. Its German rival Tado is already stressing its own independence. "We think people will worry about Big Brother knowing everything," a spokesman for the firm told me. But in the end it's probably not privacy concerns or even lower bills that will be decisive in determining whether Nest is a success in the UK. It is whether we want to have another gadget in our homes, whether family members want to wrestle over who uses yet another remote control, in short whether there is a large market beyond the dedicated technophiles for the whole idea of a smart, connected home. Google has bet $3.2bn that controlling your home via devices which talk to your smartphone is the next big thing. Now we will find out just how smart an investment that was.